The Absolut Fringe Festival have commissioned ‘Liffeytown’ for the 2010 festival from September 12 to 26. This is going to be one of the largest projects the Fringe has ever commissioned. I have been talking about doing this project for over two years so it’s incredibly exciting that it’s programmed for a major arts festival. 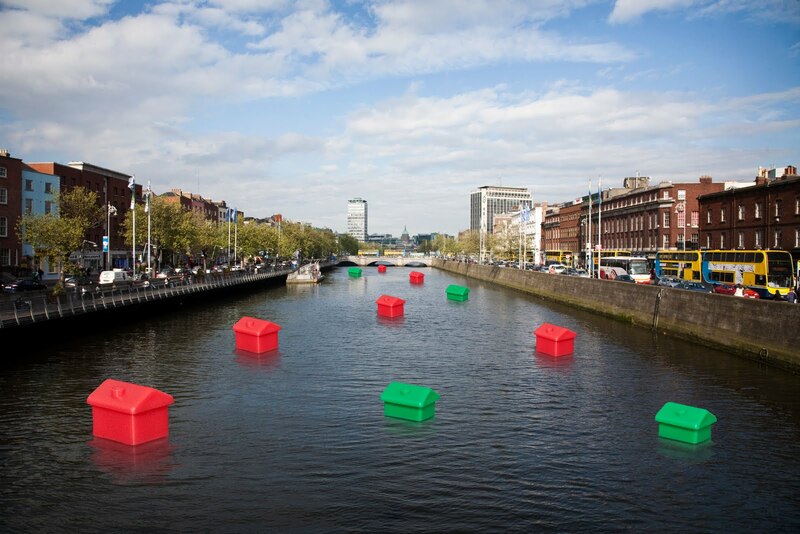 11 red and green houses will be moored intermittently on the river Liffey between O’Connell Bridge and the Ha’penny Bridge. Liffeytown is an obvious comment on the rise and fall of the property industry, it bookmarks the end of an era. 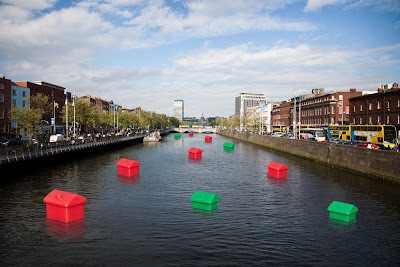 The installation equally celebrates the magnificence of the river, it’s temporary presence will perhaps rekindle an awareness of the Liffey and all it’s possibilities. Right through the boom the city was surrounded by a forest of scaffolding and cranes constructing badly planned, badly designed, disposable architecture. ‘Liffeytown’ presents itself, hopefully, as the last of these ‘ghost estates’, as a beacon that it’s time has passed and been replaced by a more sensitively attuned city. The houses illuminate at night, presenting the installation as a touching vigil, like lighting a candle in church for someone who has passed on. Ger Clancy, a brilliant sculptor and model maker is going to fabricate the houses. They will be constructed from opaque perspex panels attached to an aluminium frame. These structures fit onto a polystyrene float which will be anchored to the river bed. The houses will be lit internally at night using LEDs. Tonight I visited Ger’s house to view a scale model of the house floating in a box of water. I have written dozens of proposals and grant applications in relation to this project, it’s very satisfying all this time later to finally see a 3-D house, even if it is a fraction of the size of the real thing and floating in a green box. 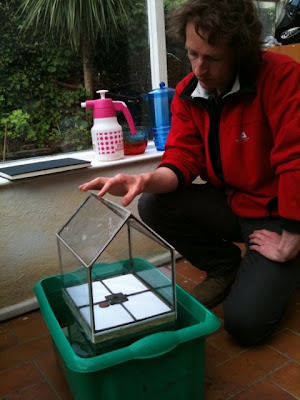 Worryingly, the model house floats a little unsteadily and is prone to tilt unless weighted with some 5 cent coins placed to one side on the base. Ger’s going to start making a full size house this weekend, we won’t really know how the house is going to work until we test it on a river and tweak the plans accordingly.